On Monday, September 24th, Mr. Zemsky met with all of our Lower School students to share Moravian Academy’s vision of the “Culture of Curiosity.” To prepare for this special assembly, our homeroom teachers used the power of the community circle to help our students reflect on all the things they may be curious about learning. To launch this special assembly, Mr. Zemsky shared the information collected from those community circles. Our students revealed a curiosity for animals, languages, sports, math, science, social dynamics, the universe, and so many more categories that simply can’t all be listed in this one post. Throughout the assembly, Mr. Zemsky helped our students to see that curiosity begins with each of us through the things that we wonder. He further shared how Moravian Academy is here to help each student explore those curiosities as they emerge. This helped to explain our four focus areas (mission skills, personal learning, collaboration, and sustaining connections) in the simplest manner to our youngest students all the way up to our fifth graders. Every student left with excitement and a wonderful “cu·ri·os·i·ty” t-shirt to wear! Watch Mr. Zemsky present our school’s new strategic vision, A CULTURE of CURIOSITY, to Lower School students. A warm BIENVENIDOS to Mathias from Guatemala who will be joining our Middle School community on October 16th. He will be hosted by an eighth-grader and his family. Mathias will be immersed in the life of a Moravian Academy student until December 9th. The Middle School has been hosting students from Guatemala for the past five years through the Faces and Our Cultures program. This invaluable opportunity is available each year to families of our eighth-grade students. It is an enriching experience of cultural discovery and resulting friendships that broaden our view of the world. UNICEF is a fundraising organization that works towards protecting the rights of children around the world. For years, our Lower School has participated in the “Trick-Or-Treat For UNICEF” to raise money for children’s healthcare. To spread more awareness this year, it will be an all-school event. Grades within each division – the Lower, Middle, and Upper School – can compete for a non-uniform day. There will be boxes designated for each grade in the Lower and Middle school lobbies and Upper School main office, where students can bring in what they collect. Individual boxes will also be given to each student in the Lower and Middle Schools. All profits will go directly to UNICEF, and our goal is to raise $600. Boxes were delivered to each Middle School student during Wednesday, October 17th’s morning meeting. There will also be boxes around the Middle School. Please join us in raising awareness and working towards protecting the rights of children by participating in Trick-Or-Treat for UNICEF! Lower School announces the pre-owned uniform shop will be open Wednesday, October 3, from 1:00-4:00 p.m. and additional Wednesdays in the future. Mrs. Shannon will help you with all your shopping and uniform needs! If you are not able to make it on Wednesdays, we have a new form to request uniform items. Copies of the form are in the office as well as available on the Resource Board on myMA. Simply complete the form and return to the office. We will do our best to find the requested items and send them home as soon as possible. Hola! All families are invited to participate in events and activities curated by the newly created Spanish Outside the Classroom Committee (SOCC). Activities and events will include group outings to Spanish language heritage and cultural festivals, parades, concerts, films, theater productions, performances, Hispanic restaurants, Spanish language book exchanges, guest speakers and volunteer opportunities. Some of the upcoming events include the following. Sunday, October 14, 2018 Mariachis Night at Fiesta Ole! Mexican Restaurant. Contact nuria.camahort@gmail.com to RSVP to join the MA group. Sunday, March 17, 2019, 4pm, “Don Quixote the Ballet” Zoellner Theater at Lehigh University. Additionally, look forward to free movie nights in Spanish in the CE Auditorium starting this winter! If you have additional questions or ideas for additional events, please contact Emmy Linman John emmyagd@yahoo.com. In Chapel this week, fifth-grade students presented a skit centered around perseverance, one of our school’s mission skills. The students’ inspiring quotes, personal stories and concluding song brought this virtue to life for everyone. Thanks to our teacher leaders for helping inspire and orchestrate: Mrs. Fessler, Mr. Andriko, Mr. Fritchman, Mr. Wallace and Rev. Nichols. Kindergarten joined this special chapel too! Last evening, the Middle School hosted our annual Parent Night, and it was great to welcome so many folks to campus. A hundred students were represented by a parent. Thank you to those who made an evening of it, braving the stormy conditions around the Lehigh Valley! For those who were unable to attend, please contact your child’s teacher in order to learn more about the sessions that were hosted. Parent Conferences will be held at the Middle School on Thursday, October 18th (3:30-7:00 p.m.) and Friday, October 19th (8:00 a.m. – 12:00 p.m. and 1:00- 3:00 p.m.). Families are welcome to bring their student(s) with them to each conference. We are using SignUp Genius to register families parent conferences. A communication will be sent Thursday next week to all families. There will be separate emails sent to each grade level. If you have students in multiple grades, please make sure to complete a sign up for each student. If you do not receive an email, please check your spam folder. If the email is not there, please contact the Middle School Main Office (610) 866-6677 or email Mrs. Morgan Wessel. Note: You will be able to schedule and edit your conferences using SignUp Genius until Friday, October 12 though we recommend you choose your date and time well before the final deadline. The Thursday late afternoon/early evening slots fill up quickly. Conferences will be filled on a first come first served basis. This month, Head of School Zemsky and the Board of Trustees are rolling out the new Strategic Vision for the school. At the September Alumni Association Executive Board (AAEB), the other members and I had a chance to hear about the plan directly from the Head of School. On behalf of the AAEB, I’d like to share an alumni reaction and perspective to the newly unveiled strategic vision and creating a Culture of Curiosity. When a new strategic plan is rolled out at your alma mater, the alumni want to know how the student experience will be affected: Will the things that made an impact on me and my journey still be there for future students? Will the principles of mind, body, and spirit still be held dear? I was happy to hear that at the beginning of the process, the board and the school community affirmed their commitment to the mission. They also set a nice framework around the mission which identifies mission skills, set to be a focus of curriculum decisions and students’ personal learning commitments: curiosity, perseverance, empathy, and creativity. They then looked at what would make future Moravian graduates “indispensable” in the uncertain and changing world we live in. In the research done on both education trends and the future of the job market, a few key things popped out: 85% of jobs needed in 2030 do not currently exist; 50% of occupations today will no longer exist in 2025; and the top ten skills according to employers has drastically shifted from hard skills 10 years ago, to more abstract skills, such as creativity, complex problem solving, and critical thinking. The school leadership wrestled with this: What implications should these findings have on how we look at educating the students of today? Moravian’s answer is to create a culture of curiosity, where personal growth, discovery, and building habits for lifelong learning are emphasized. Mr. Zemsky said something that really caught my attention when we were discussing this point; “Learning shouldn’t be something that happens to them.” He introduced the “Journey of a Learner” framework – generative learning that will help guide how students and teachers approach new concepts in the classroom, as well as how students will actively be involved in their own education, and develop the skills necessary to be indispensable once they graduate. This framework encompasses not only the mission skill of curiosity but also perseverance and creativity. The last mission skill that is emphasized in this plan is empathy, defined in this plan as the inclusion and exploration of different points of view that pushes our thinking to new depths of understanding. I truly think that this is one thing that sets the Moravian experience apart from other schools, and this has been true for as long as our school has existed. This skill has deep roots in the Moravian tradition when the Moravians realized they could really use the help of the Native Americans to make it through the tough winters in Pennsylvania with enough food. Empathy is more than being kind; it is an appreciation of what you don’t know and recognition that everyone has something to teach you. The encouragement of learning from your peers, experiencing new things and new cultures, and expanding your circle sets Moravian graduates apart, and I’m glad to hear that this important pillar of the Moravian experience will not change. In reflecting on this plan and how the student experience will be affected compared what I experienced, my main takeaway is that this: the school has taken what were some of the best and most impactful pieces of my educational journey and is bringing them to the forefront. Moravian is setting the stage to prepare students for the unknown. Through new initiatives, such as the FIRE (Freshmen Interdisciplinary Research Experience) program, students get a chance to develop the curiosity and the grit that will help them to move on to great things in our communities and the world. The approach of mind, body and spirit is now more important than ever. As our students navigate through the Lower School, they are constantly exploring who they are as individuals. As a school, we love creating opportunities for our students to celebrate and share their many identities! These past few weeks, our teachers have been helping each of our students to share who they are. In Ms. Endress’ 1st Grade class, they created visual representations of themselves and recognized how special it is to be “me.” In Senora Venegas’ 2nd Grade class, every student had the opportunity to share several characteristics of who they are in Spanish. These types of activities can now be seen throughout our Lower School as we continue to cultivate a culture of curiosity and a community where each individual is celebrated and respected. Coding is off to a strong start in grades one through five! Our students follow a program from code.org, starting in first grade, and progress through the courses all the way through the Lower School. Code.org is a nonprofit organization dedicated to expanding access to computer science in school, with the vision that every student has the opportunity to learn about computer science. Our students actively problem solve, debug, code, and work together to solve complex situations. These skills expand their creative minds and are building foundations to solve even larger challenges in the future. Holiday Hope Chests is a national project to help less fortunate children living in the Lehigh Valley. We will be distributing holiday hope chests during the holiday season. Last year, we donated 175 shoe boxes, and since 2000 the Middle School has donated 1,504! At this time, we are asking for regular size shoe boxes to decorate and fill. Please note that shoe boxes with separate lids are the easiest to wrap. Please do not send in boot boxes. Your middler can drop off shoe boxes to Mrs. Stoudt or Mrs. Long’s classroom. Thank you! Fall Admissions Open Houses: Invite A Friend! Our fall Admissions Open Houses are scheduled and we are busy preparing for many new faces on campus to learn more about our school and our culture of curiosity! We encourage you to invite a friend to these events. For personal invites or to get more information, please call 610-332-5200 or email admissions@mamail.net. School begins every day at 8:10 am with a brief advisory period. Attendance and opening activities are completed during this time, allowing for students to get off to a positive start to their school day. Please do your best to have students arrive at school on time. At the conclusion of school, students may not be picked up at the 7 East Building at the conclusion of school. Students may be picked up in car line, at the Devey Building or along the curbs along West Market Street. New Street should not be used for pick up at the conclusion of the day either. Also, please do not park or use the admissions parking area next to the Devey Building. This area is reserved for our visitors to campus. We realize this is an adjustment and appreciate your ongoing cooperation and attention to the safety of all students and faculty members. Thank you to all of the families who have submitted their health records. Please note that all new families require a new dental and physical exam as well as their immunizations record from their previous school. A physical exam is required for all sixth graders and a dental exam is required for all seventh graders. Also, seventh graders also require 1 dose of tetanus, diphtheria, acellular pertussis (Tdap) and 1 dose of meningococcal conjugate vaccine (MCV). Each school year, all middlers are assigned to an advisory group. Morning advisory period is a very important time during the school day for both students and teachers. This time allows all of us to start our day in a positive manner. This advisory group is home base every morning for morning circles, discussion about a recent life event, and for students to build connections with a teacher. Advisory groups typically average between 9-12 students all of whom are in the same grade. To build a stronger relationship with each group and between students, each advisory group designs their own flag and writes a group covenant (or group agreement) early in the school year. The advisory flag is then hung in the Cafetorium for the remainder of the school year while the group covenant is hung in the advisory homeroom location. A covenant is an agreed upon statement of expectations that all students in that group are expected to adhere to throughout the year. Here are some examples of what the advisory groups have created this school year. Moravian Academy is fortunate to have two outstanding resources to further your child’s music education through private study. The Community Music School offers after-school private lessons for many different instruments and voice and hosts these lessons in our own facilities on the Downtown Campus. The Moravian College Music Institute also offers many different types of lessons including Suzuki instruction, and they are just a short walk away at the corner of Church and Main Streets. Both the Lower and Middle Schools have Extended Session care in case there is a need before or after lessons. Please see the attached informational brochures below. We hope you’ll take advantage of these wonderful programs. Grab some fresh produce and stop by Moravian Academy’s Office of Admissions table at the Easton Farmers’ Market on Saturday, September 22nd. Spin our prize wheel to win free prizes! Invite your neighbors and friends. The market runs – rain or shine – from 9:00 am – 1:00 pm in Easton’s Historic Centre Square. For more information, visit www.eastonfarmersmarket.com/. Parents’ Night is an important night in the life of a school. It’s a chance to shine a light on programming, introduce new and returning faculty members, get to know what students will be exploring in their classes, and build relationships with everyone in our community. We will officially begin at 6:30 pm on Wednesday, September 26 in the 7 East Cafetorium. For those able to attend, Mr. Zemsky will provide a presentation on the new strategic vision of Moravian Academy at 6:00 pm. Parents should pick up a name tag at the registration table located in the foyer of 7 East. Parents should enter the door closest to the corner and traffic light. Student’s schedules will be available for parents that will include an S day schedule. The schedule will include a key that will have the teacher’s name, the course name, and the building and classroom where the course is taught. Families that have students in multiple middle school grades will need to divide or determine which items they will attend. *The bells will be used throughout the night to announce when to move from one location to another. Five-minute passing time is built into the schedule. There will be a handful of students on campus to assist parents throughout the evening. Students will be positioned in both the Devey and 7 East Building. Parents will be able to visit all student classes that occur on an ‘S’ Day. Each classroom visit will be 10 minutes. Parents will move around the campus similar to a student’s day. Please wear comfortable shoes. During class visitations, a teacher will explain his/her curriculum, provide a syllabus/course overview, and discuss any special projects or events in the course. Contact information will also be provided. There will be optional presentations for parents to attend beginning at 8:30 pm at the conclusion of the classroom visits. Parents may choose from five different presentations hosted by a member(s) of the MS faculty. Presentations should be 10-15 minutes with a little time for Q&A following. Moravian Academy school spirit and camaraderie shined across all three divisions during today’s Red and Gold Games 2018! Congratulations to the Red team, who was named the 2018 Red and Gold Games Champion! Thank you to everyone who made this event a success! Each fall, our kindergarteners go on a “bear hunt,” looking around campus for our lost teddy bear, Corduroy. Students visit the different buildings on the lower school campus. Beginning in the classroom, students follow clues to the Devey building, where they meet faculty, staff and students who help them on their way. Students walk through God’s Acre to the old Gym, the Main Building, the CE Building and finally the playground. Happily, Corduroy is always found safe and sound! It’s a great opportunity to learn about the vast space that is Moravian’s lower campus, and to discuss practical safety measures with students, all while having some outdoor fun! This past Wednesday, September 12th, our Lower School hosted a Parent Night for 1st, 2nd, and 3rd Grade families. It was a night filled with great laughter as our teachers used Developmental Designs (DD) to help parents become comfortable in the classrooms. From Coconut to various name games and greetings, our parents jumped in and participated just like their own children! It quickly became an energizing night that helped to strengthen the relationships of our teachers and parents. We look forward to seeing our 4th and 5th-grade parents on Thursday, September 20th and our Primer, Pre-K, and Kindergarten parents on Tuesday, September 25th to join in on our Lower School fun! Lower School enjoys Community Time in the afternoons. Wednesday are chapel and Fridays are assemblies or classroom activities. At last week’s assembly, students sang with gusto during a traditional sing-along. Get a front-row seat every morning for MABC. School doors open every morning at 8:00, and our MABC program will begin earlier this year at 8:15 a.m. in its new location on the first floor of the Main Building. Class time will immediately follow. As a reminder, fifth-grade leaders invite all students to contribute content. Just send Mrs. Polefka or the MABC staff your stories and make an appearance on the big screen! Our next SAMS event is the Back to School Picnic on Friday, September 28 at Hanover Township Community Park at 3660 Jacksonville Rd, Bethlehem, PA 18017. Students will have the opportunity to enjoy the basketball and tennis courts, surrounding fields, and friends while listening to music and enjoying pizza and snacks. Students will be bused to the park from school, and pick-up is at 5:30 PM at the park. Please park and report to a grade level faculty chaperone along the path to sign out your student. We are in need of some parent volunteers who are able to assist teachers in chaperoning this event. If you are interested, please contact SAMS co-chair Patty Cunningham at 484-560-0874 or cunninghampa@gmail.com. On Saturday, October 13th, please join us for two favorite annual Moravian Academy events, the 5K Family Fun Run/Walk and Country Fair! For more information and to purchase tickets or unlimited-rides wristbands, click here. The Middle School commemorated the men and women who lost their lives during the September 11, 2001 attacks on our country with a moment of silence following the Pledge of Allegiance today. A handful of teachers embedded this historic day into their classroom lessons and invited conversation with students, including seventh grade American History, taught by Mr. Lucas, and seventh grade English, taught by Mr. Brennan. While in Washington DC in November, the eighth grade will also visit the Newseum and explore the 9/11 exhibit honoring the fallen, see artifacts from this fateful day, and explore this event and its impact on our country and the world. Congratulations to our 2018 Red and Gold Games Captains! We look forward to your spirit and leadership at the games on Friday, September 14th. On Friday, September 14th at 7:30 pm, Moravian Academy Orchestra Director Ms. Chase Morrison will be playing her electric cello in Miller Symphony Hall’s performance of “Mike Krisukas & Friends: More Zen Music.” The performance is part of Miller Symphony Hall’s “Jazz Upstairs” series. Dave Smith on sax and flute. This group of accomplished musicians brings an original music journey to the stage in every performance, challenging and invigorating audiences while leaving them thinking long after the show. 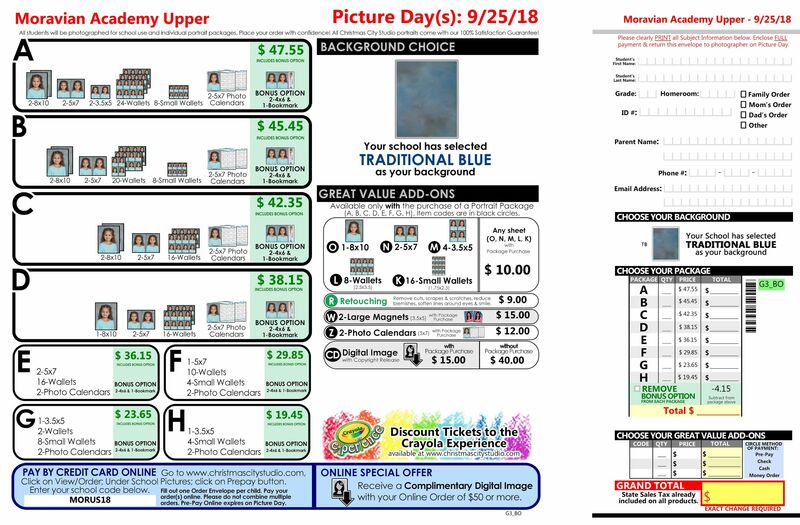 Christmas City Studios will be on campus on Wednesday, September 12th to take school pictures at the Lower School. Online ordering may be completed at https://orders.christmascitystudio.com/Login.aspx. The event school code is MORLS18. If you are unable to order online, you may call the Studio at 610-691-2109. Please print out your receipt and give it to your student(s) to bring with them to school. Welcome Ms. Beth Binder, Office Assistant! We are happy to announce that Ms. Beth Binder joined the Lower School office staff this week. Her hours are 11:00 am – 4:30 pm. Ms. Binder’s higher education experiences are from Bucks County Community College and Kutztown University in the field of Fine Arts. Recent employment experiences include purchasing for Kitchen Magic, toddler YMCA teacher and sales and technical support. Her varied skills and education will suit our needs well at the Lower School as she engages with students, parents and faculty. Welcome! Students in third, fourth and fifth grade are stepping up to be community leaders in the lunchroom. Ms. Binder and Srta. Medina offered training to the first set of volunteers this week. Student roles in the lunchroom include wearing an ambassador smock, leading the prayer, issuing a five-minute reminder to finish eating and bus trays, instructions to rise, push in chairs and refill or collect pitchers of water. All students in these three grades will have this opportunity to shine. Are you buried under crowded bookshelves at home? Or perhaps, you need some fresh titles? The Library Guild is here to help! Please consider gathering up those unneeded books and donate them to the Used Book Sale at the Country Fair. Collection bins will appear in the Lower School foyer October 1. You can also deliver books directly to the Used Book Sale Booth on the day of the fair which is Saturday, October 13. As we continue to cultivate a culture of curiosity, our Lower School has been working together to establish community expectations through Developmental Design (DD) practices. As shared on The Origins Program website, DD is “a powerful collection of teaching practices to help elementary staff work together to achieve educational equity and excellence in their classrooms. Developmental Designs for Elementary School: Teaching for Education Equity—based on research and strengthened by developmentally responsive teaching strategies—present a personalized learning approach to help your staff better connect with students, address children’s specific strengths and needs, and help students develop essential cognitive and social-emotional skills. These practices also help build trust among the adults in the school and with families. In order to experience this process of collaboratively creating a Social Contract, the Lower School faculty and staff created one before the first week of school. Taking this experience, each homeroom teacher had the opportunity to create a Social Contract for each classroom. A representative from each homeroom then collaborated with students from other grades to narrow down the Social Contract to five concise phrases. This process was not only fun but also an opportunity to see how our values aligned. We will soon share our school-wide Social Contract during an assembly. We will then commemorate the launch of our very first Lower School Social Contract by capturing every student’s signature and making it visible in our building! The annual Red and Gold Games Day competition is right around the corner. This year, the games will occur on Friday, September 14. The Middle School will run a modified schedule on this day, including some additional time in advisory groups and grade level activities. All middlers will ride school buses to the Merle-Smith Campus and enjoy a morning of athletic games and lunch. Following the competition, all middlers will return downtown for a regular dismissal. It is a non-uniform day, and students are encouraged to wear their team colors. Dress guidelines for the day are included here. We look forward to a great day of school pride! We are very excited to announce a wonderful opportunity to travel to Canada during Spring Break 2019! This trip is available for ALL seventh and eighth-grade students at Moravian Academy Middle School. The group will depart on Friday, March 8th and will return on Tuesday, March 12th. French and Non-French speaking students will use their language skills in real life situations and will have the opportunity to explore Canadian history and culture through a variety of activities. This trip will include visits to Old Montreal, Notre-Dame Basilica, Quebec City, the Plains of Abraham, Chateau Frontenac, Montmorency Falls, and attending a professional ice hockey match. International travel nurtures academic and personal growth. Being in a new place encourages students to explore their curiosities, to adapt to a culture different than their own, and to delve into other parts of the world outside the global language classroom. Cultural immersion tours are an excellent resource for learning. The tour code is TD6MAMC. The cost of the trip is approximately $1200 with 20 students participants, which includes motorcoach transportation, hotel stays, admission fees, and most meals. Additional information can be found here, including the sign-up deadline, information regarding a passport, and a timeline of events. For additional information about the 2019 Spring Break trip to Canada, please contact Mrs. Emily Quinn at equinn@mamail.net. Come stop by Moravian Academy’s Office of Admissions table at the Lehigh University vs. Villanova University football game on Saturday, September 8th. Spin our prize wheel to win free prizes and take a picture with the Moravian lion! Invite your neighbors and friends. Tickets to the game can be purchased here. Kick-off starts at 12:30 pm at Lehigh University’s Murray H. Goodman Stadium. Our Middle School students celebrated the start of the new school year with a Back-to-School Dance on Thursday, August 30th. Students danced the night away, took silly pictures in a photo booth, and enjoyed pizza and other snacks. A fun time was had by all! Parents – Thank you for your patience as we implemented some new dismissal procedures for our evening dance events. We are working on our safety measures for dismissal at social events to ensure a safe pick up for all students and all families. Our goal is always to provide a safe environment for each student and family. We learned a few items and will have them corrected for our next school dance on Friday, November 1. Last week, our Middle School students took full advantage of their new post-lunch access to the gym. This year, for the first time ever, the Academy of American Poets is inviting students in grades 9 through 12 to submit designs for the 2019 National Poetry Month Poster Contest, which will be judged by award-winning poet Naomi Shihab Nye and renowned graphic designer Debbie Millman. Submissions will be accepted from September 1 to October 31, 2018. The winning student will be featured on Poets.org and in American Poets magazine and will receive a signed book by Naomi Shihab Nye and a $500 prize. In April 2019, the poster featuring the winning design will be sent to 100,000 libraries, schools, bookstores, and community centers nationwide. This is an incredible opportunity to have artwork published nationwide and I encourage interested students to submit designs! With our ongoing efforts to ensure the safety and security of our community, we are making an adjustment to our student pick up procedures to ensure that every child is being picked up by an adult or person who has been approved by the parents. All student pickups at the end of the school day by parents or another family member should occur at the Devey Building, along Market Street in front of the Devey Building, or in the Lower School carline. The only students who will be dismissed from the 7 East building will be those students who ride the athletic shuttle to Glasser Fields. Students with an advisory in the 7 East building who go back to their locker at the end of the school day will need to depart from the Devey Building or be picked up in carline. For the safety of everyone involved, please do not double park along Market or New Streets and also, please use the crosswalks designated for pedestrians. A crossing guard will assist with crossing students and families. Thank you for your understanding and helping us ensure a safe campus.